As a follow-up to last month’s total lunar eclipse, this image shows the comparison of the apparent moon size at U3 (end of totality) with the previous eclipse of July 2018, both observed in Cologne, Germany. 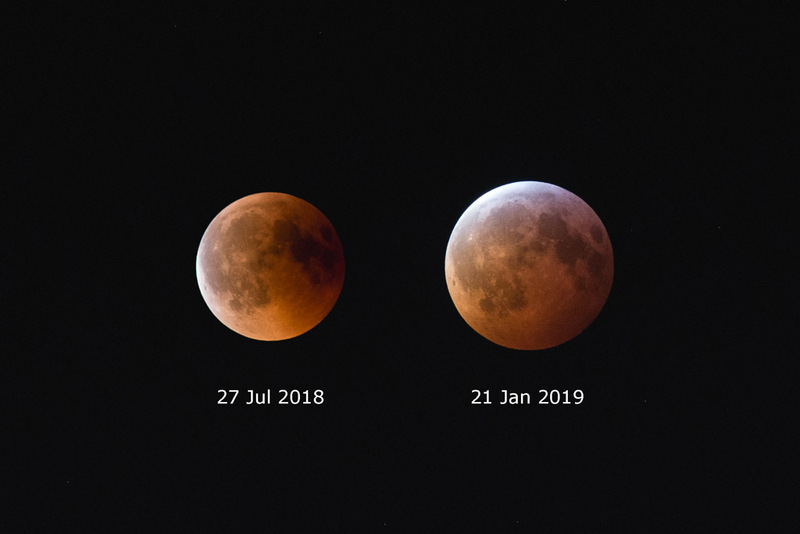 Left: Total Lunar Eclipses of 27 Jul 2018 at U3 23:13:12 CEST, distance* Cologne-Moon 406 196 km, full moon at apogee, sometimes called “Micromoon”. Right: Total Lunar Eclipse of 21 Jan 2019 at U3 06:43:24 CET, distance* Cologne-Moon 358 064 km, full moon at perigee, nowadays called “Supermoon”, giving rise to the blatant “Super Wolf Blood Moon” nuisance. This entry was posted in Astronomy, Astrophotography, Cologne, Eclipse, Photography and tagged astronomy, astrophotography, Cologne, Eclipse, EN, events, germany, moon, photoblog on 2019-02-09 by mj.